From “Mary, Mary, Tall and Scary” to “Wee Willie Werewolf,” this collection of classic nursery rhymes turned on their heads will give readers the chills–and a serious case of belly laughs. 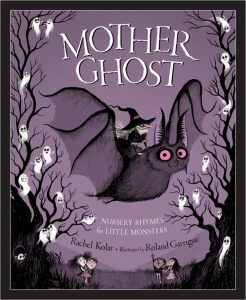 With clever rhyme and spooky illustrations, Mother Ghost is perfect for getting in the Halloween spirit. Boo! Mother Ghost: Nursery Rhymes for Little Monsters is available on Amazon, Books-a-Million, Barnes & Noble, Target, or directly from Sleeping Bear’s website.